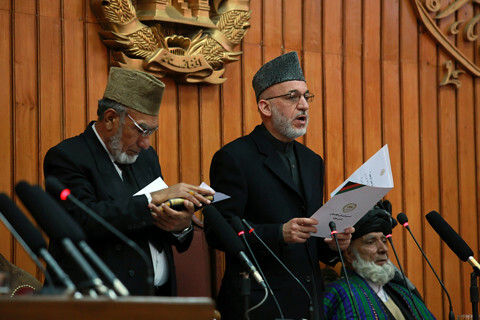 Presidential elections seen as crucial to Afghanistan’s stability after the withdrawal of NATO troops at the end of 2014 will be held on April 5 that year, a poll official said Tuesday. Afghanistan’s Independent Election Commission said in a statement that the date for the vote had been set and would be officially announced at a press conference on Wednesday. But a senior official in the commission told AFP on condition of anonymity that the scheduled date was „Hamal 16, 1393“, referring to the Afghan solar calendar. The date coincides with April 5, 2014. Der amtierende Präsident Hamid Karzai darf nach der Verfassung nicht erneut antreten. Seine Amtszeit läuft im Mai 2014 aus. Das Wahldatum ist vor allem deshalb für die Planung der ISAF-Staaten von Bedeutung, weil es darum gehen wird, eine ordnungsgemäße Machtübergabe an den Nachfolger hinzubekommen. Bevor die Kampftruppen, wie es der Plan vorsieht, bis Ende 2014 abziehen. Die International Crisis Group hatte kürzlich vor schweren Verwerfungen und der Gefahr eines Bürgerkrieges aus diesem Grund gewarnt. Vier Tage früher wäre passender. Ist ja quasi eine offizielle Ankündigung: Qualifikation für den Bürgerkrieg ist vorbei, jetzt geht es in die Vorrunde. Ohje. Das wird noch richtig spannend. Wir dürfen auf den Interessenausgleich gespannt sein. „last gasp“ of the Taliban! KABUL, Afghanistan (Oct. 31) – An International Security Assistance Force service member died as a result of a non-battle related injury in southern Afghanistan today. It is with great sadness that the Ministry of Defence must announce that two soldiers from 1st Battalion The Royal Gurkha Rifles have been killed in Afghanistan today, Tuesday 30 October 2012.